Does not fit GATOR™ seats. Q: Will this fit the seat of a JD LT133 lawn tractor? A: If your back rest measures 11 inches then this seat cover should be compatible. Fits the John Deere L110 perfectly. The pockets on the back are an added bonus and the cover is well made and comfortable. Thanks again. I am pleased with the construction and overall quality of this seat cover. I am trying to figure out how to tighten the elastic cord at the hem. The cover fits loosely given the length of the elastic cord. 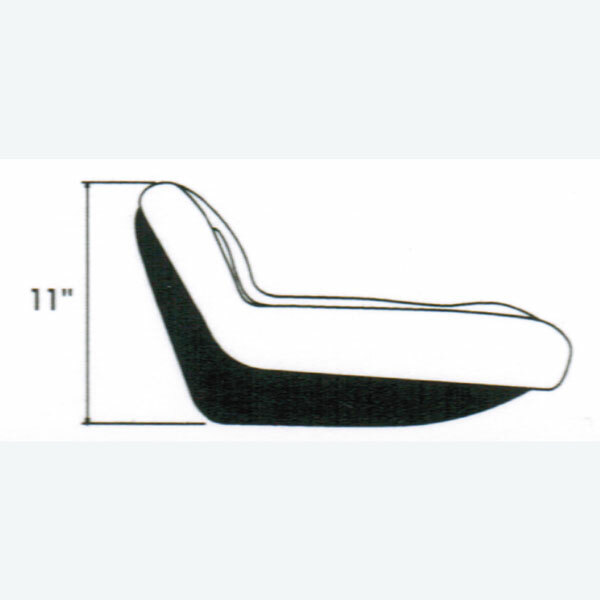 When making turns or mowing downhill the operator slides with the loose seat cover. At minimum this is uncomfortable and possibly a safety issue. Merchant Comment: John DeereTractor Model LA115. Customer was able to manually knot the elastic to better fit the seat. 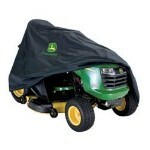 We recommend that this Seat Cover not be used for the John Deere Model LA115 Lawn Tractor. We appreciate our customer's assistance in this matter. 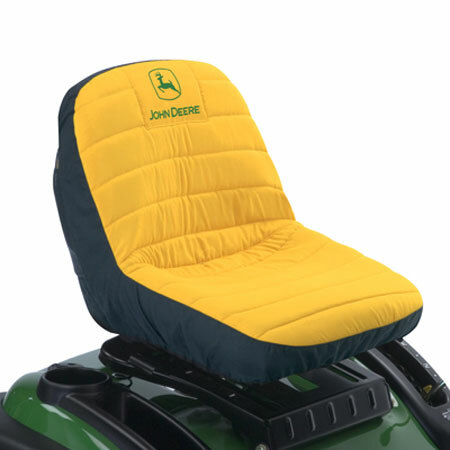 Thought about replacing the seat of my JD lawn tractor. Plastic was split in several places making the tractor look old and ugly. Purchased this instead and saved money as well as improving the appearance. Neat, good fit and looks great. Logos on the cover are a nice touch. I put this on my 2000 LT155 because the seat was cracked but also because it was super slick. I have some extreme slopes. I took double sided golf grip tape on the seat and activated it just as installing a grip. I placed rubber drawer liner over that and then installed the cover pressing it down and into position. After drying it is much better than the original seat on side hill mowing. Great product. Fit perfecly. Love the pockets. After trying to buy this 11-inch seat cover at both Lowe's and Home Depot I happened to find it at a good price on www.greenfunstore.com. The seat was easy to install, and fit perfectly. 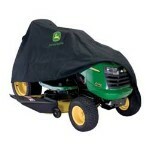 The fabric does cause you to slide somewhat when cutting on a slope, but not enough to distract your mowing. I was more impressed with the communication and speed of shipping from the Gree Fun Store! I received my item within two days in the mail from when it was ordered. Amazing!! I bought this for a Scott's tractor, manufactured by Deere. After 8 yrs of use, the seat was tearing in multiple locations. Duct tape would hold it together temporarily but would eventually peel off from getting on & off the tractor. So, I performed a final duct tape surgery and bought the seat cover. The cover fit is great. The fabric is much more comfortable than the plastic seat. It slides some when getting on/off the tractor, but it beats buying a new seat.